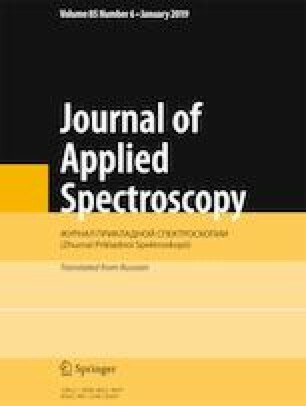 Absorption and fluorescence spectra of positive and negative solvatochromic merocyanine dyes of the same structural type in polymer films of various polarities, e.g., polystyrene, poly(vinyl butyral), and poly-N-epoxypropylcarbazole, are studied. Negative solvatochromic merocyanines are more prone to aggregate than positive solvatochromic ones. Quantum-chemical DFT calculations explain this by the larger dipole moments of the former. Merocyanine aggregates have a sandwich structure that causes fluorescence quenching. Aggregation occurs at higher dye concentrations in the more polar polymers. The studied merocyanines exhibit noticeable solvatochromism in the polymers, like in solutions. Polyene–polymethine transformations in the merocyanines are the most important factor determining their ability to fluoresce in the polymers, despite the fact that the fluorescence intensity of the merocyanines increases on going from solutions to polymer matrices. Translated from Zhurnal Prikladnoi Spektroskopii, Vol. 86, No. 1, pp. 42–50, January–February, 2019.